Please note, the postage quoted for all buckets is 3 to 5 working days delivery. Next working day delivery can be arranged, please telephone for details. 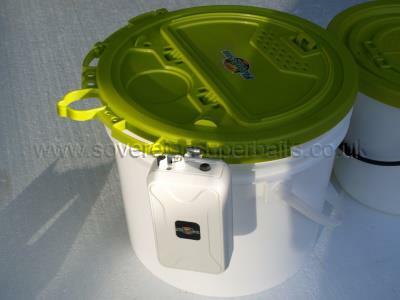 Below is an extremely robust livebait bucket aimed in Europe at the semi-professional / guide. These buckets will take more punishment, last longer and hold more livebait than most others on the market, so they should last the ordinary live bait angler a considerable amount of time. They come with a single speed air pump (A) as standard. They have a much easier to operate catch on the livebait cage than all of the other buckets out there and nothing to "rust". They come in one size only, 13 litre and are made in Europe no China ! 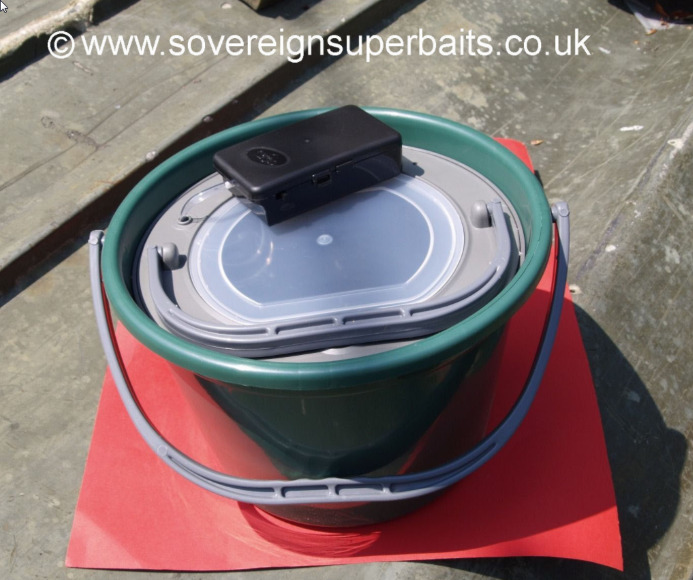 As with everything else we stock we have tested these buckets to destruction and they withstood well in excess of three times their load capacity before the handle failed (we filled one with lead weights), so there is no possibility of this bucket letting you down under normal fishing conditions. (Remember it is illegal to transport freshwater fish from one water to another without the correct DEFRA paperwork). Air Pump A: made in Europe, runs on two U2 (torch type) batteries (not included), it also comes with approximately 1/2 m air tubing and a 20mm air stone. 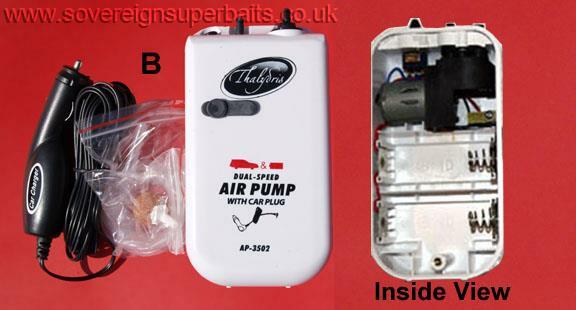 Air pump B is a two speed pump, with the ability to plug in to the cigar lighter in your car & on your boat. 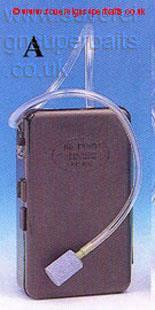 The two together make this a 3V pump, but with the ability to plug in to a 12V system using the adapter supplied. This is NOT a 12V pump as many other companies advertise it as. 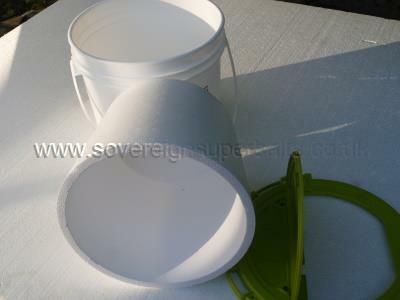 This bucket holds 3.5gl / 12.75ltr, it measures 12" Dia. x 10.375" tall. Package Includes 3.5gal bucket with "flexi" handle, Premium Bait Bucket Lid (#6062BC) with accessory rails & vented easy-open bait compartment lid & 1" insulating foam liner to keep your live bait at a constant temperature. This bucket is designed for temperature sensitive live baits like sand eels, which expire for no apparent reason in normal buckets. However it is a well known fact that cold water holds more dissolved oxygen than warm water, so adding a couple of ice packs to this insulated bucket will keep your bait fresh & lively for longer. 6053BC - Same bucket as above, but with NO insulation. Package includes :- 3.5gal / 12.75ltr 12" Dia. x 10.375" tall, Premium Bait Bucket Lid (#6062BC) with accessory rails & vented easy-open bait compartment lid. 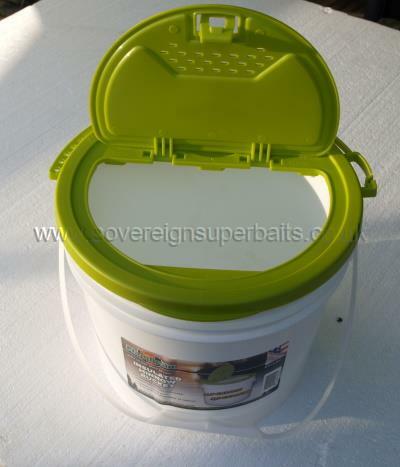 This is a normal live bait bucket for all your normal live bait requiremants.